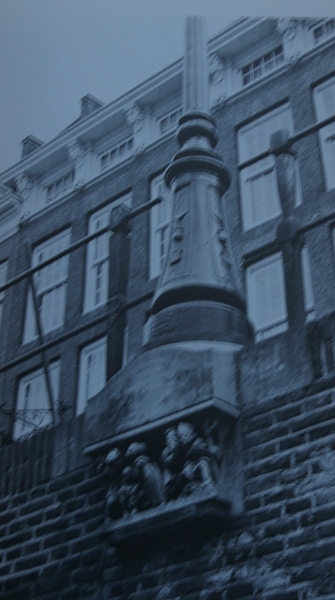 From 1870 there were cast iron lampposts along the channels in Utrecht. In 1953 the painter Pyke Koch drafted a new lamppost. In the same year the sculptor Groeneveld did hack the first lamppost-cantilever, ‘The Arm of Utrecht’. After him the sculptors Esenbrink, Roverso, Meeuwse, Bürgi, Reinhard, Wouters and Geerlings have begun to make cantilevers. By now their number is more than 300. They decorate the Oudegrracht, the Nieuwegracht and the Kromme Nieuwegracht. The cantilevers have been made from blue freestone, coming from Belgium. Their dimensions are mostly 60 × 40 × 13 centimetres. The purpose of the cantilevers is to give pleasure to interested passers-by. In this goal they have succeeded amply.